Spring has sprung, which means the Association for Public Art’s outdoor sculpture conservation program is in full swing. Every year, our team conducts conservation maintenance for over 30 outdoor sculptures in Philadelphia and takes on special projects as needed. 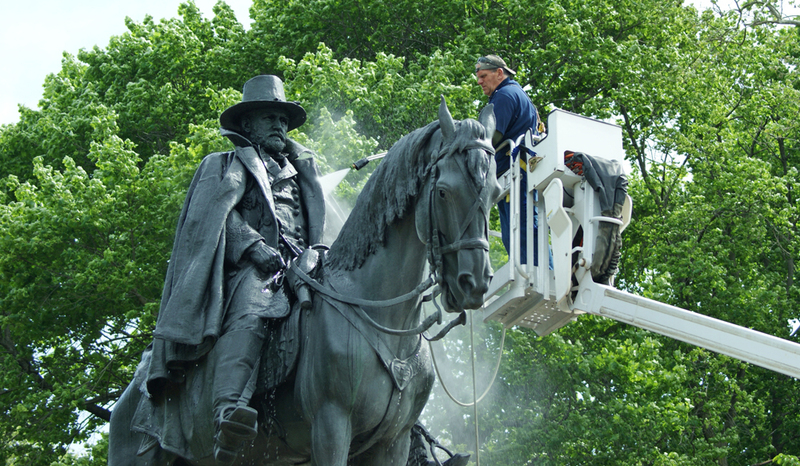 The work involves an inspection of the general condition of the sculptures, removal of any surface grime and graffiti, washing, and renewed application of a special wax coating for the bronze artworks. Launched in 1982, the Association for Public Art’s program is perhaps the longest continuously operating sculpture conservation program of its kind in the country. A major focus this year will be repairing Martin Puryear’s Pavilion in the Trees (1993), one of the artist’s earliest public works. Located in West Fairmount Park, the structure was damaged during a storm in late 2017 after a tree collapsed onto the artwork’s sixty-foot walkway. 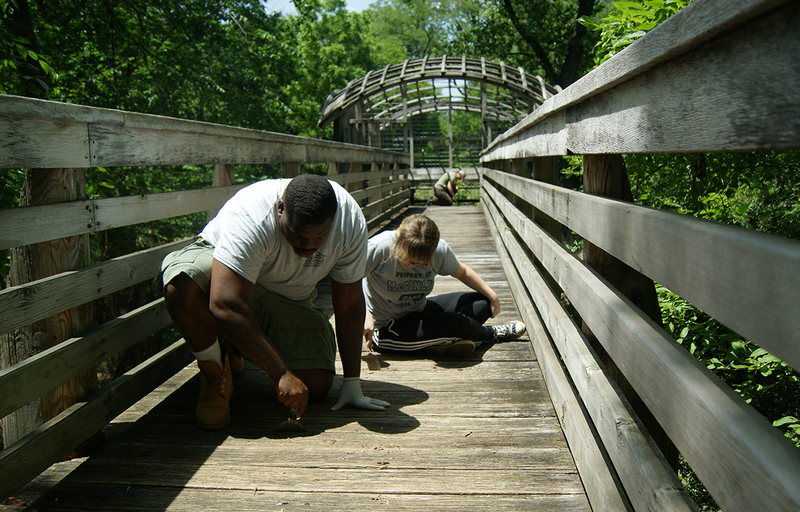 Conservators from the Fairmount Park Conservancy worked with the Association for Public Art to rebuild the walkway so that the amenity can be reopened. Many are familiar with the Puryear’s massive Big Bling (2016) sculpture, which was installed along Philadelphia’s Kelly Drive from June – November 2017. *For conservation updates and photos, follow us on Instagram and Facebook. Poised in a Greek dress, the figure draws on classical imagery – characteristic of Paul Manship’s earlier works.